The number of new 16-18 apprenticeship starts has continued to rise although the level of new starters in adult provision has fallen, according to new provisional Skills Funding Agency statistics. Statistical First Release data published today for the first two quarters of 2015/16 show the overall number of new starts is up by 2,400 to 251,100 – a 1 per cent increase on last year’s figures. The biggest driver behind this is again the rise of under 19 apprenticeships – up by 5,500 to 84,200 new starts (7 per cent). However while 16-18 new starts rose, the number of adult provision continues to fall. The biggest decrease was in the 19-24 category, which saw new starts fall by 3,800 to 77,100 – a drop of 4.7 per cent. Digging into the figures by levels show under 19 intermediate level apprenticeships rose by 2,600 to 54,900 (5 per cent) with advanced level apprenticeships for under 19s up by 2,500 to 28,200 (9.7 per cent). In terms of percentage, the highest increase was the number of under 19s starting on a higher apprenticeship – up by 500 to 1,100 (83.3 per cent). However the number of 19-24 intermediate level apprenticeship starters fell by 4,600 to 41,500 (10 per cent). 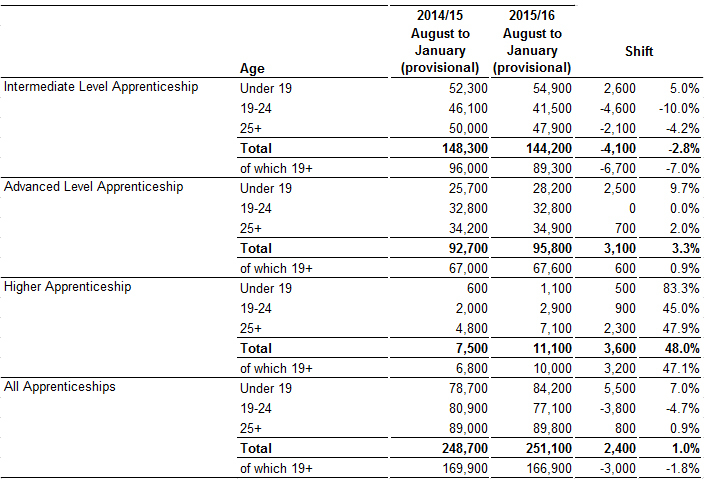 The figures also reveal that in the six months from August to January only 1,100 starts are on the new apprenticeship standards (0.4%), up from 400 for the whole of 2014/15 (table below). A government response to the figures focused on a “dramatic increase” in the number of higher apprenticeships, which rose to 11,100 starts (4.4% of all starts) compared to 7,500 (3% of all starts) for the same period last year. Skills Minister Nick Boles said: “Apprenticeships offer the life changing opportunities working people deserve. The growth in the number of higher apprenticeships is fantastic, and shows that apprenticeships deliver the advanced, technical skills businesses need. Look at the proportion of people aged 25+ on apprenticeships, WOW! Can we have some stats please on the average wage apprentices are paid, so we can make a more informed judgement on how Apprenticeships are helping employers and the economy.